The last post for the day I promise. My contact in Tokyo tells me that all-on effort by the government and the mass media is on: Everything is back to normal, and radiation is safe. April Fool's Day was the beginning of a new fiscal year in Japan. For major TV stations, it is a time to switch to their new spring programming. My contact says the news related to the March 11 earthquake and tsunami, and Fukushima I Nuclear Power Plant's accident (which TEPCO calls "event") gets reported only in the regular news time. No more "earthquake/tsunami special" or "Fukushima Nuke Plant special". Plutonium? Don't worry it's a heavy matter. It won't spread very far so it's safe. Radiation leak? Iodine-131 in water? Sure it's there but no ill effect on health, it's safe. And have you heard the news that TEPCO submitted the annual plan for electricity production to the government (they are required to submit every fiscal year), and the plan still included the scheduled construction of Reactors 7 and 8 at Fukushima I Nuclear Power Plant? I have a feeling that the plan won't get revised. Hamaoka Nuke Plant in Shizuoka Prefecture that sits in the dead center of the expected Tokai Earthquake is set to resume operation soon, having conducted the emergency safety drill. Also, a cute little trivialization of the serious news about the highly radioactive pit that TEPCO failed to block with concrete. The special polymer that they are going to use to plug the hole upstream is the same polymer that is used in disposable diapers. Oh how nice. Diaper material can stop radioactive water. Who could have known? We will know soon enough if Murphy's law is alive and well. TEPCO will do that diaper polymer operation in the afternoon their time. Taking a break from Japan's earthquake/tsunami/nuke crisis... to tell you you don't need to read about Fukushima I Nuke Plant to get freaked out. You can dismiss it as "quackery". I'm just linking. In an interview, he called his finding "it." Huber said this is all he knows: "It's a life form." It could be innocuous, Huber said. It may have been around for a long time, even if scientists never knew it. Obama's Food Safety Czar, Michael Taylor, used to be the vice president at Monsanto. #Fukushima I Nuke Plant: Is It a "Crack" or Is It a Drain? Is it just me, or does it look like water gushing from a drain that was there in the pit before the accident? You know, the drain that you would normally see in the pit like this, to drain water that gets in the pit after the rain, for example? TEPCO is calling it a "crack" (20 centimeters long). I'm sure it's a crack, and water on the other side of the crack is spewing as if from the round, cylindrical conduit....?? OK it's just me imagining things. Today at around 9:30 am, we detected water containing radiation dose over 1,000 mSv/h in the pit* where supply cables are stored near the intake channel of Unit 2. Furthermore, there was a crack about 20 cm on the concrete lateral of the pit, from where the water in the pit was out flowing. At around 12:20 pm, we reaffirmed the event at the scene. Asahi Shinbun has a series of photos that TEPCO has provided of the pit that's been leaking highly radioactive water into the ocean. Go take a look. But what was the point of pouring concrete when the water kept coming in to the pit? Didn't they think that it might be better to plug the opening upstream first, so that the water at least stop coming before they attempt to seal the crack in the pit? And a diagram created by Asahi. Reference to Reactor 3 containment vessel being cracked has been scrubbed clean. Washington's Blog links and cites a segment from New York Times March 25 article in which an anonymous Japanese executive in the nuclear industry says there is a huge crack on the containment vessel of the Reactor 3 in Fukushima I Nuclear Power Plant. Concerns about Reactor No. 3 have surfaced before. Japanese officials said nine days ago that the reactor vessel might have been damaged. Hidehiko Nishiyama, deputy director general of the Japan Nuclear and Industrial Safety Agency, mentioned damage to the reactor vessel on Friday as a possible explanation of how water in the adjacent containment building had become so radioactive. Michael Friedlander, a former nuclear power plant operator in the United States, said that the presence of radioactive cobalt and molybdenum in water samples taken from the basement of the turbine building raised the possibility of corrosion as a cause. But I located the missing paragraphs between the 1st and the second paragraphs above, by locating a cached article on the mirror site. Thank you Google. And after these missing paragraphs, Michael Friedlander appears, not Nishiyama. Is there, or isn't there, any water in the Spent Fuel Pool on any Reactor at Fukushima, but particularly on Reactor 4? Now the Nobel-prize winning Secretary of Energy assures us there is water, and that's what the Japanese government and TEPCO have been insisting all along. But this expert begs to differ. Commenting on the video of Reactor 4 (that I posted on March 31 here, too; video was taken on March 24) he says there is no water left, water is not filling the pool, the spent fuel rods are exposed, and that's probably the source of plutonium and cerium that have been detected. Watch Arnie Gundersen of Fairewinds Associates. I already wrote a post about the lack of dosimeters for the workers at Fukushima I Nuke Plant and the absence of proper radiation monitoring until April 2. Yomiuri Shinbun says it conducted the telephone interview with a TEPCO PR manager who's been at the plant to coordinate between the plant and the TEPCO headquarters [in PR matters]. Yomiuri Shinbun conducted the telephone interview with a TEPCO PR manager, Keiichi Kakuta, who's been at the plant to coordinate between the plant and the TEPCO headquarters [in Tokyo]. Kakuta said TEPCO "has secured 920 dosimeters" and the workers are getting three meals a day, instead of two. 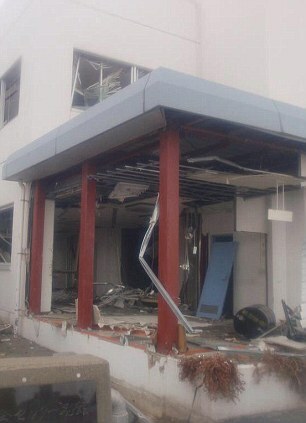 "The work conditions are improving, though it remains severe," said Kakuta. TEPCO sent for 500 dosimeters from TEPCO's Kashiwazaki-Kariwa Nuclear Power Plant in Niigata Prefecture on April 1, after it was revealed [by the news media] that there weren't enough dosimeters for workers. Even though the number of meals has increased to three, the meals still consist of emergency foods and canned foods. "Volume is OK, but no variety." Of 400 workers at the plant, 100 of them get to sleep in at the facility in Fukushima II Nuke Plant which is about 10 kilometers away. Some workers still have to sleep on the corridor as there is not enough space to accommodate the remaining 300 in the designated sleeping quarters in the building 免震重要棟 in Fukushima I Nuke Plant. Kakuta said "The workers are not necessarily getting enough sleep, but their morale is high as they know that people are cheering for them." Let's see, what will be the new missing item that TEPCO will no doubt dribble out (that's their mode of operation, to the point that the Japanese with short attention span - there are many - will forget what they were hearing before)? My guess at the moment is the full-body anti-radiation suits. Toshiba generously (I'm sarcastic) donated 45 dosimeters on April 1, and said they would also donate 744 water-proof suits coming from Babcock & Wilcox. Toshiba workers are at the plant, probably not wearing the suits. Their press release on April 1 (available in Japanese only) says there are 150 Toshiba workers at the plant on an ongoing basis at the request of the government and TEPCO, and total 400 Toshiba workers have already worked at the plant at one time since the accident. The 200 full-body anti-radiation suits that were already donated by a Florida company, which can be worn without assistance, I have no information on them. I can hazard a guess: they are sitting in a custom warehouse somewhere in Japan. Follow-up on my post from last night. Murphy's law. You can pretty much bet the next attempt will go the same way. Mainichi Shinbun has BOTH the diagrams of that part of the plant AND the photograph of the vertical shaft (they call it "pit", photo is from TEPCO) that TEPCO had found highly radioactive water gushing into the ocean and which it tried to pour concrete on April 2. TEPCO announced on April 2 that it had found highly radioactive (1,000 milli-sievert) water at the bottom of the pit, a vertical shaft made of concrete, near the ocean, at around 9:30AM. The pit is 1.9 meter x 1.2 meter x 2 meter (length x width x depth), and 10 to 20 centimeter-deep water was found at the bottom. From 1.2 to 1.4 meters FROM THE SURFACE OF THE WATER, the radiation exceeded 1,000 milli-sievert/hr, and near the top of the pit close to the surface the radiation measured 400 milli-sievert/hr. The side of the pit that faces the ocean has a 20-centimeter crack [doesn't say 20 centimeter in width or the length], through which the contaminated water was flowing into the ocean. TEPCO said it just found out that the trench that is now filled with the radioactive water [that trench, during the normal operation, remains dry, and it houses pipes for the condenser unit to cool the turbine] and the trench that houses electrical cables were connected near the ocean [see the diagram]. [The pink square in the lower right is the pit. The fat, grey lines indicates the pipe trench filled with contaminated water. The fat white line coming out of the pit is the trench for electrical cables. Notice the pipe trench connects to the cable trench near the pit. Iodine-131 and other radioactive materials were detected in the same, high concentration from both the pit water and the water in the pipe trench. TEPCO had noticed the high radiation coming from this pit on April 1, but it was not until the morning of April 1 that they found water in the pit and tested it for radiation. As to the reason for this delay, TEPCO explained that it didn't occurred to them that the contaminated water from the trench may have gone into this pit, and that they weren't vigilant enough. On April 2 afternoon, TEPCO poured 5 cubic meters of concrete and filled the pit [1.9x1.2x2=4.56], but that didn't stop the contaminated water flow into the ocean. On April 3 morning, TEPCO will attempt to drill a hole at the junction of the two trenches [i.e. one that has been filled with contaminated water and the one that houses electrical cables which connects to this pit] and pour in the special resin that will expand on contact with water. Nuclear and Industrial Safety Agency (NISA)'s Nishiyama says "Water from this pit may be one of many sources for the contamination of the ocean," and has ordered TEPCO to check for other cracks around the Reactor No.2 as well as more samplings of seawater near the pit. Nishiyama also said "This may be one of [several] sources of sea water contamination." Mr. Nishiyama is backtracking. Yesterday he was strongly indicating this pit was THE source of contamination. He is such a fine specimen of a Japanese career bureaucrat. Instead of asking lowly workers who may actually know a thing or two about pipes and ducts and trenches, TEPCO and the government (most notably PM Kan) have been seeking advice from the nuclear experts - scholars, researchers - many of whom probably do not have a clue how a nuclear plant is physically laid out. Don't hold your breath waiting for successful plugging of the trench junction with this special resin. Even if that succeeds, Nishiyama now admits the leak from this pit may be just one of many that they don't know yet. By the way, NISA's Nishiyama is the one who threatens the Japanese with blackouts unless they continue to accept nuclear power (see my older post here). It is at Cryptome.org, as fukushima-areva.zip. The presentation, dated April 1, 2011, was created by Dr. Matthias Braun of AREVA, an international nuclear energy company based in France. The original looks to be in German. The presentation is a good summary of what has happened to the Reactors since the earthquake and tsunami incapacitated the plant on March 11. Spectacular explosions of Reactors No.1 and 3 are not so bad as they look, as only the steel structures on top of the concrete containment structures collapsed. More worrisome is the Reactor No.2, with a damage to the Suppression Pool. Radioactive materials are escaping freely from that damaged Suppression Pool into the atmosphere. So are the Spent Fuel Pools in the Reactors No.1 through 4. Particularly Reactor No.4, because the entire core fuels were in the Spent Fuel Pool due to maintenance - hotter than the other Spent Fuel Pools in other Reactors. Significant core meltdown on Reactor No.1, lesser meltdown on Reactors No.2 and 3. Leakage of the pools due to Earthquake? Dr. Braun seems to think that the "corium" (melted mass of fuel rods and other things inside the Reactor Pressure Vessel) is still within the RPV in each Reactors (except Reactor 4, which was empty due to maintenance). There is something very ugly and evil looking about the containment structure... I guess it is just me. Tokyo Electric (TEPCO) announced that it was confirmed at about 9:30AM that the water containing high level of radioactive materials was flowing out into the ocean from near the water intake for the Reactor 2 at Fukushima I Nuclear Power plant. Contamination of the seawater near the plant has continued but the source of contamination hadn't been identified till today. The identified source was a 2-meter deep concrete shaft near the water intake for the Reactor 2. It was created for the inspection of power cables, but water 10 to 20-centimeter deep was found at the bottom of the shaft at about 9:30AM. The radiation level of the water was measured at 1,000 milli-sievert. There is a 20-centimeter crack on the side of the shaft, and the contaminated water is leaking through the crack into the ocean. TEPCO plans to fill the shaft with concrete to stop the leak into the ocean. Question: Where does that water come from? Or see it on Youtube. In Alabama they do both judicial and non-judicial foreclosures, though primarily non-judicial (according to this site). Naked Capitalism (4/1/2011) reports that a judge in Alabama overturned the foreclosure action "based on the failure of the trust to comply with the terms of the pooling & servicing agreement". So it matters after all? At least in Alabama? That these TBTF national banks, as loan originator, aggregator, servicer, trustee of the REMIC and trustee of the trustee of the REMIC (usually their affiliated company or 100% subsidiary), cannot ignore the PSA that they themselves had created and supposedly signed, according to the law of New York State, and never bothered to follow by actually properly transferring all the mortgages with proper endorsement within the time-frame as specified in the PSA? Really? I mean really? Paul Jackson has been forced to eat a bit of crow. A judge in Alabama in a case called Horace v. LaSalle overturned a foreclosure action based on the failure of the trust to comply with the terms of the pooling & servicing agreement. As you see, the judge ruled that the borrower can assert rights under the Pooling and Servicing agreement as a third party beneficiary and that he was “surprised to the point of astonishment” that the trust had not complied with the terms of its PSA. The ruling in favor of the borrower endorses an argument we have made since last year on this blog, that the pooling and servicing agreement stipulated a specific set of transfers be undertaken to convey the borrower note (the IOU) to the securitization trust within a specified time frame. New York trust law was chosen to govern the trusts precisely because it is unforgiving; any act not specifically stipulated by the governing documents is deemed to be a “void act” and has no legal force. So if a the parties to a securitization failed to convey a note to the trust within the stipulated timetable, retroactive fixes don’t work. In this case, the note had been endorsed by the originator, Encore, but not by the later parties in the securitization chain as required in the pooling and servicing agreement. See the order and more at the link. I have no idea how the State AGs or the federal regulators are going to "fix" the mess which starts with loan origination and securitization to sale of the certificates to servicing to foreclosure process, all of which, as far I have figured, are null and void. Here's the vid I made some time ago about the whole process and post on Youtube. There are still so many homes going to foreclosure, and in more than half the states (non-judicial states) homeowners, even if when they do know about the fraudulent securitization that could invalidate the foreclosure, don't have recourse unless they can afford to hire a real estate attorney (who may or may not know much about securitization). I wanted to create the sequel to this video, explaining the foreclosure fraud part. But alas, Xtranormal decided to charge users to create the vid. Oh well. Zero Hedge has the latest aerial photo of Fukushima I Nuke Plant (taken on March 31, midday) with the analysis by Chris Martenson. Worth taking a look and reading the analysis. Click on the link. One very strange thing about the photos, as Martensen also points out: No workers on the ground, no staging area, no fire engines. One concrete pump with the long boom trying to water the Spent Fuel Pool in the Reactor No.4. Are TEPCO people and the Japanese government feeding us with lies, or should I say "hope"? Is the truth that in a reality-based world they've long given up on the plant, and no one is at the plant but the operators of the concrete pump? Or the workers simply off to their lunch. Go to Criptome.org link to see the close up view of the plant taken by Air Photo Service on March 20. Dribbling out the information per excellence, even if the frank disclosure at the onset of the crisis may have prevented unnecessary accidents and unnecessary exposure of the plant workers and the residents around the Plant to high radiation. Also, the power has been restored to the 8 radiation monitoring systems placed near the perimeter of the Plant. They will be tested on April 2, and if they are operational they will be put to use. So they were off-line the whole time, until April 1st. What a joke. And by now you may already know that the workers at the plant weren't given a personal radiation monitoring device. 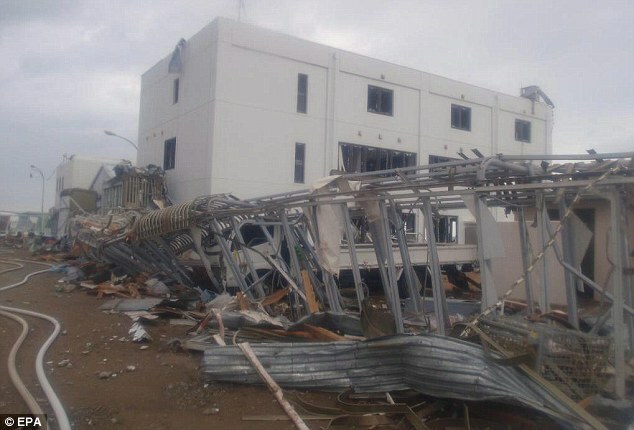 TEPCO had 5,000 such devices (dosimeters) at the plant, but the tsunami after the March 11 earthquake swept almost all of them away, and they had only 320. Of that 320, workers had accidentally took them home, and there are less numbers available for each worker to use. So what did TEPCO do? Call up every nuclear plants, research institutes in the world, not just Japan, and ask them to send them all the dosimeters they can spare to Fukushima, and call the prime minister to allow for expedited custom clearance? And do the same for the radiation monitoring systems, perhaps with solar panels attached so that they don't need external power source? Or at least put them back online as soon as they had the power back in the control rooms? Noooooo. TEPCO gave one docimeter per a group of workers and decided to assume that was adequate, and waited until April 1st to restore power to the plant's radiation monitoring systems. About the three workers who were irradiated the other day. Did they each have a dosimeter? We don't have the information at hand right now, we will look into it, and will get back to you later. And the Japanese people were asked to stand behind TEPCO and cheer, by one of Naoto Kan's ministers. #Fukushima I Nuke Plant: "Where is Radioactive Water Coming From?" Japan's national regulators and TEPCO still can't figure out where the highly radioactive water is coming from that's flooding the basements and trenches and shafts and how it is apparently finding its way into the ground water. Or so they say. And oh by the way that's got nothing to do with the radioactive materials found in the sea water nearby in high concentration, or so they say. "Extend and Pretend" continues, on a grand scale. Contaminated water with high concentration of radioactive materials has been found in many places in TEPCO's Fukushima I Nuclear Power Plant. The radioactive water has been found in the basements of the turbine buildings, trenches outside the buildings, and has now been found in the ground water. They [regulators, TEPCO] do not believe the contaminated ground water has anything to do with the contaminated seawater, and they haven't been able to pinpoint how the radioactive materials have found their way into the water. It is understood that the radioactive materials found in high concentration in the contaminated water comes from the cooling water from the Reactor Pressure Vessels, in which the nuclear fuel rod assemblies have been partially damaged. But how has this water seeped into the ground water? TEPCO is mulling four possibilities: (1) water that has been sprayed [on the building to cool the Spent Fuel Pools] and poured into the reactors and got contaminated; (2) rainwater that captured radioactive materials released in the air; (3) contaminated water in the turbine building basement; (4) contaminated water in the trench outside the building. It is possible that there are more than one routes. Huh? So, the cooling water gets contaminated when the water is pumped into the Reactor Pressure Vessels to keep the fuels inside cool, because the fuel rods are damaged. Why do they (or Yomiuri reporter) have to obfuscate by bringing up rainwater? The (3) and (4) are clearly the same water that comes from (1). What do they mean exactly by "damaged" fuel rods? From what I've read, it probably means that cladding (cover that wraps around uranium pellets to form a fuel rod) made of zirconium alloy has either expanded and ruptured or has squeezed into uranium pellets (depending on the pressure), and the fuel rods has melted, at least partially, and probably partially fused with the control rods, which contain silver and cadmium among other metals, all the while releasing radioactive materials in high concentration. A meltdown of the fuel rods forms the mass is called "corium". There are two ways, as far I can figure, for this contaminated water in the RPVs to escape the RPVs. One way is through the pipes that circulate the contaminated water back to the turbine rooms; either the pipes or valves connected to the RPVs are damaged during the earthquake and started to leak, and the water started to accumulate on the turbine building floor, and then found its way into the trenches and vertical shafts, which, as TEPCO has admitted, may not be leak-proof. And so into the ground water. However, there has been no news that TEPCO pinpointed the exact leak locations. Partly, at this point, radiation is probably too high in the turbine buildings or reactor buildings for humans to enter and examine. Another way is through the RPVs themselves, if they are indeed damaged, as indicated already by TEPCO and Nuclear Safety Commission. 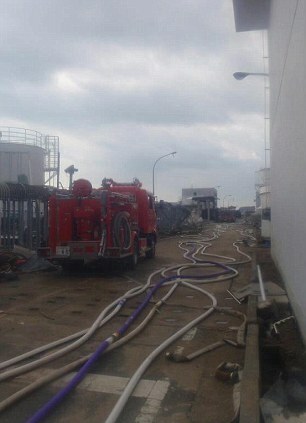 But if the RPVs are damaged and leaking, they are still housed in the Containment Vessels. Unless the Containment Vessels are also damaged and leaking. Then the very awkward question would still remain; it's actually so awkward that there's no way I can mention it without being arrested by the Japanese National Police for spreading "false, harmful rumor". The RPV is on the left building, connected to the turbine on the right building. See the dotted green arrow coming from the area where the Spent Fuel Pool is located? The arrow goes from there to the floor of the Reactor building or the passage that connects the two, into the ground. Another green arrow goes directly from the turbine building floor into the ground. A light green oblong blob in the center depicts the ground water. Now, how would the water go from the floor of the building into the ground? Unless there's a crack in the concrete floor. Is it possible to have a crack in the floor that goes deep enough in a nuclear reactor building? How is the floor of a reactor building or a turbine building constructed? And how could it crack? Go read this article in wiki for more on the "corium". Since the State AGs cannot seem to get their act together to settle with the mortgage servicers (i.e. big commercial banks in the US) and sell out homeowners (see my March 7 post on that "progress"), the federal banking regulators are stepping in with their own solution, reports American Banker. Turbo Timmy and Blackhawk Helicopter Ben to the rescue of their beloved TBTF Wall Street banks! Ta-dah! How could the federal government step in, with uniform federal solution, to what's essentially a state affair? More than half the states have non-judicial foreclosures where the homeowners' rights and recourse that they would have in judicial states do not even exist. Oh I forgot; it's not about the homeowners. They step in so that the banks can move forward. WASHINGTON — Frustrated by the lack of progress with a global settlement between the 50 state attorneys general and the top mortgage servicers, federal banking regulators are expected to move forward with their own enforcement actions against 14 servicers as early as next week. The cease and desist orders are expected to establish best practices for the servicing industry, including new documentation verification procedures, oversight from third parties and additional legal counsel, limitations for dual tracking foreclosures and modifications simultaneously, and a comprehensive look back to uncover prior mistakes. But they soundly rejected the primary push from the AG proposal — principal reductions. Speaking to reporters after a U.S. Chamber of Commerce event on Wednesday, JPMorgan Chase & Co.'s chairman and chief executive, Jamie Dimon, put it bluntly. "Principal writedowns for people who couldn't pay their mortgages? Yeah, that's off the table," he said. Make sure you view my vid on foreclosuregate that tries to explain from the origination of the mortgage to foreclosure. #Japan #Earthquake: Japanese Police to Crack Down on Internet "Rumors"
While there is no news in the Japanese media about the world's largest concrete pumps going to Fukushima I Nuke Plant to water AND pump concrete to entomb the reactors ("Chernobyl" solution), the Japanese government is keen on prosecuting those who spread "rumors" about the quake/tsunami/nuke plant disasters on the Internet and by word of mouth that are "harmful". The National Police Agency disclosed on April 1 some of the rumors that have been circulating on the Internet and by word of mouth which the Agency deems false and without a solid basis. For 28 such cases on the Internet message boards, the Agency had requested the entities that manage the sites to take them down. The rumors such as "looting of goods in outskirts of Sendai", which spread in the shelters in Miyagi Prefecture [Sendai is the capital of Miyagi Prefecture] and subsequently reported on the Internet message boards, but there was no looting or theft at the particular shopping mall that was named in the rumor. These false rumors spread through word of mouth, chain mail, and Internet postings using ficticious newspaper names. Since they cite specific locations and business names, people tend to believe them, and there are inquiries to the police and the prefectural governments. The prefectural police in the quake/tsunami affected areas are patrolling the locations specified by such "rumors" to dispel the fears of the residents. The police will consider prosecution of entities or individuals behind the false rumors for libel and interference of business operation. There are many burglaries in the affected area. There is a band of foreign burglars armed with knives stealing. There are many cases of abduction of young girls. People are sold a counterfeit ticket for gasoline (a true one would entitle them to get gas). There is no such abduction in the affected area. A funny thing, though, that major newspapers like Yomiuri have been reporting thefts, burglaries, and con jobs in Tohoku and Kanto areas immediately after the initial shock of the earthquake/tsunami wore off - i.e. one or two days later; evacuees' empty homes are broken into, heating oil and gasoline stolen. They have reported many con men and swindlers who dupe people into paying them the "earthquake/tsunami" relief money, in one case to the tune of $12,000 from a retiree. Is the Police saying you have to be a big newspaper, magazine, TV in order to "authoritatively" write about those incidents? Who is going to determine which "rumor" is "false"? What about announcements made by the government and Tokyo Electric Power Company (TEPCO) ever since the earthquake/tsunami/nuke plant accident? Reactor No.4 was supposed to have had "fires", if we are to take their words. Just look at the picture of Reactor No.4. It had explosions, not "fires". People were led to believe that as soon as the power was restored at Fukushima I Nuke Plant things would get moving and quickly. Then the government and TEPCO dribble out the truth - oh there's literally tons of water in the basements and trenches about to spill into the ocean, oops the hazardous waste processing facility has been flooded, oh the pumps for the condenser systems are broken. Do these qualify as "rumors" that were actually "harmful"? Of course not. They come from the power that be, and they were very "true", at that moment. It is indeed like Japan before and during the World War II, as many old people in Japan privately say. They personally remember how it was back then. An increasing number of younger people seem to be catching on, who do read news and commentaries on the Internet that never make it to the mainstream media there. Information wants to be free, and it will break free. False information notwithstanding. 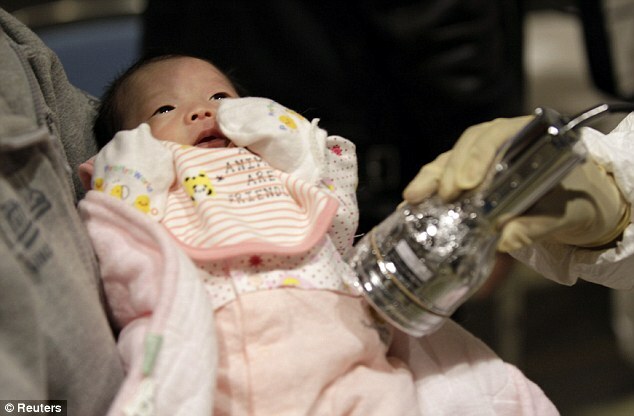 The baby, Nagashima Rio, was born on March 15, according to the caption at Daily Mail. Even after the horrendous accident at Fukushima I Nuke Plant, a top official at Japan's Nuclear and Industrial Safety Agency says Japan has no choice but move forward with nuclear power plants; the alternative is blackouts. For those of you who've been wondering what's the difference between Japan's Nuclear and Industrial Safety Agency and Nuclear Safety Commission. Even for many Japanese people, who are not aware that they are two different entities with very different attitudes toward nuclear energy. The former, Nuclear and Industrial Safety Agency, is one of the agencies that belong to Ministry of Economy, Trade and Industry, which is an advocate and watchdog for just about every industry in Japan. The Agency is a strong advocate for the nuclear industry, and just like any other government agencies it is run by career bureaucrats, some with technical/science degrees but most with economics/finance/law/political science degrees. The latter, Nuclear Safety Commission, is an adjunct to the Cabinet Office, and its commissioners are researchers and former professors from prominent institutions in nuclear research. The Commission "is charged with a range of missions including planning, deliberation and making decisions on regulations and policies related to nuclear safety as well as prevention of radiation hazards, based on expert knowledge on nuclear technologies and radiological protection" (from their statement), and advise the Prime Minister accordingly. Here's a Wall Street Journal's article about the former, Nuclear and Industrial Safety Agency, from March 24, written by Norihiro Shirouzu. He wrote practically the same article in Japanese, though there were some interesting minor differences. Shirouzu says that the Agency is an advocate for the industry, and hints that the rolling blackout that TEPCO started right after the earthquake in Tokyo metropolitan area may have been a way to send a message to the Japanese people: Without nuclear power, you are going to have blackouts. TOKYO—A top official at Japan's nuclear-safety regulatory agency sees no slowing in the country's campaign to expand atomic power, despite the battle to contain the world's worst nuclear crisis in 25 years, saying in an interview that the alternative is "blackouts." "There aren't that many easy alternatives available for us," said Hidehiko Nishiyama, a former trade negotiator tapped to help deal with the Fukushima nuclear crisis, on Wednesday. "Japan couldn't go forward without nuclear power in order to meet its demand for energy today," he said. About 30% of Japan's electricity output comes from nuclear, and the government has set the goal of increasing that to 40% by 2020. The 54-year-old career bureaucrat—who has emerged over the past two weeks as the public face of the government's efforts to calm a jittery global public—said industry is likely to face severe opposition to expanding reliance on nuclear power, especially as reports of the fallout intensify, with news Wednesday that Tokyo tap water had been contaminated. But a significant curb in nuclear power would mean rampant blackouts, he warned. "I don't think anyone could imagine life without electricity," Mr. Nishiyama said in the 40-minute session. "Realistically, we need to come up with nuclear power stations that could withstand severe accidents," such as the earthquake and tsunami that threw the Fukushima Daiichi plant in northeastern Japan into a crisis. He said Japan and its nuclear-power industry need to find a solution to make reactors' backup power and cooling systems more resilient to such events. That view mirrors Mr. Nishiyama's position as a top official in a bureaucracy —a director-general at Japan's Ministry of Economy, Trade and Industry—that both regulates and promotes the nuclear-power industry. The trade ministry, known as METI, has in recent months been revving up a push to help Japanese power companies win deals to build nuclear reactors abroad, as part of a larger effort to market Japan's "infrastructure technologies," such as nuclear energy and high-speed trains, aggressively overseas. Mr. Nishiyama said Wednesday his agency—Japan Nuclear and Industrial Safety Agency—"remains steadfastly independent" from the larger trade and industry ministry. He said Japan, as a country, has made sure of NISA's independence by setting up a second agency attached to the cabinet named the Nuclear Safety Commission. NISA's independence from METI and the nuclear industry is just as steadfast as the Federal Reserve's independence from the US government and Wall Street. The bureaucrat is openly blackmailing the Japanese. Accept the nuclear power plants that are "safe" by his Agency's standard, or suffer power blackouts. This Fukushima I Nuke Plant accident (which by the way TEPCO and the Agency continue to refer as "event" or Jisho in Japanese) must have been a divine event to drive that message home. And TEPCO did such a haphazard, disastrous rolling blackout, which is taking a break for a few days. There are many Japanese who are indeed cowered into accepting his premise - without nuclear power plants, they will have blackouts, and they will die of heat in the middle of summer or of cold in the dead of winter. But more and more people are finally saying enough is enough, even if they are rather harshly criticized by pro-nuke people in Japan (split was about 50-50, even after the accident). Nuclear and Industrial Safety Agency's job is to make sure things are safe, for the industry. DVD released by Tokyo Electric Power Co (TEPCO) on April 1 (not a joke). It was taken on March 24. Even bigger concrete pumps are coming to the Plant. See my previous post. Courtesy of iwakamiyasumi, posted at USTREAM. The article says there are only 3 such concrete pumps in the world, with 70-meter booms and operated with remote control. They were all made by a German company, Putzmeister. Two of them will go to Fukushima. There's also a 58-meter-boom pump from Vietnam going there, and two 62-meter-boom pumps are already on the way to Fukushima from Germany. They will be first used to pump water for cooling, then to pump concrete, it is understood, according to the article below. The world’s largest concrete pump, deployed at the construction site of the U.S. government’s $4.86 billion mixed oxide fuel plant at Savannah River Site, is being moved to Japan in a series of emergency measures to help stabilize the Fukushima reactors. “The bottom line is, the Japanese need this particular unit worse than we do, so we’re giving it up,” said Jerry Ashmore, whose company, Augusta-based Ashmore Concrete Contractors, Inc., is the concrete supplier for the MOX facility. The 190,000-pound pump, made by Germany-based Putzmeister has a 70-meter boom and can be controlled remotely, making it suitable for use in the unpredictable and highly radioactive environment of the doomed nuclear reactors in Japan, he said. The pump was moved Wednesday from the construction site in Aiken County to a facility in Hanahan, S.C., for minor modifications, and will be trucked to Atlanta’s Hartsfield Airport, where it will be picked up by the world’s largest cargo plane, the Russian-made Antonov 225, which will fly it to Tokyo. The move to Atlanta, he added, will require expedited special permits from Georgia’s Department of Transportation, due to the weight of the equipment. If all goes well, the pump will be en route to Japan sometime next week. According to Putzmeister’s website, four smaller pumps made by the company are already at work at Fukushima pumping water onto the overheated reactors. You whisper something to a person next to you and tell that person to whisper the same thing to the person sitting next to the person next you. On and on, and after many "next" persons, your initial whisper is probably no longer recognizable. I observed something similar yesterday, over the IAEA's recommendation that the Japanese government consider expanding the 20-kilometer radius evacuation zone in light of the radiation level in Iidate Village. We informed the counter-party, and the counter-party have indicated that it is already under assessment. Criticised for weak leadership during Japan's worst crisis since World War Two, Prime Minister Naoto Kan has said he is considering enlarging the evacuation area to force 130,000 people to move, in addition to 70,000 already displaced. Put two and two together, the reader gets the impression that Prime Minister Kan has already agreed to IAEA's recommendation and about to implement a wider evacuation zone. the current level is not a dangerous level to the health, and "Not of nature to consider such thing (as expanding the evacuation zone)." Having said that, Edano added, "If this goes on for a long time, there is a possibility of those radioactive materials accumulating in the body and affecting the health, so we have to consider carefully. We will try not to be late (in issuing an evacuation order). IAEA is recommending a wider evacuation zone. If we don't follow their advice, Japan may be considered as a pariah state like North Korea and shunned from the international community. What do you think the Japanese government should do, to not become like North Korea? So, IAEA's suggestion on one village in Fukushima Prefecture became the fear of being treated like North Korea in the international community and a puzzled VP at TEPCO. Not to mention that "under assessment" as understood by IAEA (or Reuters) may be quite different from the Japanese government's "assessment" or consideration. In a long tradition of elite bureaucrats as observed in Japan and UK (possibly France, but I don't personally know), you say you will "consider" when you don't want to give an answer right away or you don't know the answer. You will "consider carefully" when you want to stall further. You will "have it referred to a committee" if the counter-party is persistent, and you will "have it referred to a committee to assess whether it is appropriate to consider the subject and will get back" to the counter-party in "due course", instead of saying "No" flat out. IAEA should know that well. After all, it is made up of bureaucrats, and the secretary general is a career diplomat from Japan. Japanese Government Planning "Nationalization" of "Affected Areas"
April Fool's joke? I don't know. The Japanese government, who has been criticized outside Japan as "behind the curve" in dealing with the Fukushima nuclear plant crisis, is well ahead of the curve when it comes to possibly nationalizing the land in the areas affected by the March 11 earthquake/tsunami and by Fukushima I Nuclear Power Plant accident. A government seems always very quick on one particular thing: to expand its reach anywhere they can get away with. "Never waste a good crisis." And the Japanese government has not just one but three - earthquake, tsunami, and nuclear accident. An outline of the special legislation for rebuilding after the March 11 earthquake (Higashi Nihon Kyodai Jishin, East Japan Great Earthquake), which the administration and the ruling party (Democratic Party of Japan) want to pass by the end of April, was revealed on March 31. Since there are quite a few places along the Pacific coast that suffered tsunami and where it may be difficult to rebuild, and with a possibility of prolonged resolution to the Tokyo Electric Power's Fukushima I Nuclear Power Plant accident, the current system of the national government paying the three-quarters of the mass relocation cost will be revised, and the ratio will be raised. A system will be introduced to allow the national government to quickly purchase the empty land after the mass relocation of the residents and nationalize it, so that the recovery and rebuilding can be done in a systematic manner. As to the funding source, gasoline tax cuts of 25 yen (30 cents) when the average regular gas price per liter exceeds 160 yen three months in a row will be abolished. The tax cuts could result in reduced revenue of several hundreds of billions of yen (several billion US dollars). Prime Minister Kan allowed only two journalists to ask questions. One from Yomiuri, the other from France's Le Monde. Kan is simply aping Obama. What a shame. He's also aping Obama on global warming, nuclear power, and creating "czars". TEPCO just finished an afternoon press conference (around 5:40PM JST 3/31/2011). At the end, they announced that from now on their Public Relations manager will hold regular daily press conferences, and Vice President Muto will hold a conference once a week. So the press will have to deal with a PR person from now on. They will be about the same intellectual and knowledge level, TEPCO PR and the press. I expect a lively exchange on the topics that will avoid anything technical and fundamental. IAEA's concern was Iidate-mura (village), which is located at 40 kilometers northwest of Fukushima I Nuclear Power Plant. The Reuters' article suggests the Japanese government has already agreed to or is already considering expanding the evacuation zone. Chief Cabinet Secretary Edano didn't say anything remotely like that, though. He and the spokesman from Nuclear and Industrial Safety Agency both said they would "consider" carefully before deciding anything on evacuation, and hope the decision would be not too late. For them, being a stickler for bureaucratic procedures and rules is their safety, a comfort blanket, in the time of nuclear crisis which they, with the collaboration of the media, try to portray as a long-term nuisance at worst. Regarding the IAEA suggestion that the government consider issuing the evacuation recommendation to the residents of Iidate-mura in Fukushima Prefecture where highly radioactive materials have been detected from the soil, Chief Cabinet Secretary Edano in the press conference in the morning of March 31 said the current level is not a dangerous level to the health, and "Not of nature to consider such thing (as expanding the evacuation zone." Having said that, Edano added, "If this goes on for a long time, there is a possibility of those radioactive materials accumulating in the body and affecting the health, so we have to consider carefully. We will try not to be late (in issuing an evacuation order) when we need to, by conducting the sampling and analysis of air and soil in the wider areas." On the other hand, METI's Nuclear and Industrial Safety Agency's spokesman Hidehiko Nishiyama said that "IAEA's data is only one indicator [among many others]. We need to consider further before we decide (whether to order the residents of the village to evacuate)." There were still 114 residents remaining in the village, as of March 27. They died in the quake/tsunami, but the bodies cannot be recovered and sent to the morgue because they've been exposed to high radiation after their deaths, and the police fears the secondary radiation exposure from the bodies. It was found through the interview with the police on March 31 that the police estimates there are between several hundreds to a thousand bodies of people who died during the earthquake/tsunami within the 20-kilometer radius evacuation zone. On March 27, high radiation was detected from the body found in Okuma-cho in Fukushima Prefecture, 5 kilometers from the Fukushima I Nuclear Power Plant. The police points out that "These are bodies of people who got exposed to radiation after they died." The police is looking for ways to recover the bodies without exposing the policemen to the secondary radiation. At first, the police was planning to remove the bodies outside the 20-kilometer evacuation zone for autopsy, but the plan now has to be revised. According to the police, it is not just the policemen who may be exposed to the secondary radiation when they try to recover the bodies; the policemen, doctors, and family members at the morgue may also be exposed. Ministry of Economy, Trade and Industry (METI)'s Nuclear and Industrial Safety Agency (NISA) announced on March 31 that from the water sample taken at 330 meters from the water drain from the Reactors 1 to 4 at TEPCO Fukushima I Nuclear Reactor iodine-131 was detected at 180 becquerel/1 cubic centimeter, or 4,385 times the limit. The Agency is going to increase the sampling points further out in the ocean, and will analyze underground water in the plant compound. According to TEPCO, fission products from the damaged fuel rods in the Reactors or the Spent Fuel Pools may have entered the sea water. However, TEPCO cannot confirm whether the fission products have come from the water drain, and doesn't yet know how they reached the ocean. Besides iodine-131, cesium-134 (half-life 2 years) was detected at 783.7 times the limit, and cesium-137 (half-life 30 years) was detected at 527.4 times the limit. even though they were all true to the specs. I hope something like this didn't happen at Fukushima I Nuclear Power Plant. I am reading an old monograph written by a nuclear plant engineer in Japan who died in 1997 from radiation-caused cancer. His name is Norio Hirai. He was no celebrity scholar or commentator who adorns the TV screens over in Japan every day these days but he seems to have been an engineer who knew what he was talking about, and fought against nuclear power plants in later life (till his death) that he helped built. The monograph is about the reality of nuclear power generation and nuclear power plants as he experienced firsthand for 20 years. One particular minor detail he discusses in the paper caught my attention. It is not about Fukushima I Nuclear Power Plant, but about Monju Fast Breeder Reactor run by Japan Atomic Energy Agency in Tsuruga City in Fukui Prefecture (Japan Sea side). I have this nagging feeling that something quite similar to the incident he describes may well have happened also at Fukushima I Nuclear Power Plant. Or for that matter, any nuclear plant in Japan, but gone uncorrected. Last year (1995), on December 8, Power Reactor and Nuclear Fuel Development Corporation (which later became Japan Atomic Energy Agency)'s Monju [Fast Breeder Reactor] had a severe accident where sodium leaked and caused a huge fire. This accident was not Monju's first. I was called to the plant 6 times during the construction, as my former subordinates were in charge of Monju, so they would call me when there was a problem. At that time, I had already quit the company [Hitachi, as it revealed later], but I went because a nuclear plant accident, once that happened, would be irreparable. Once [during the construction], I received the telephone call, asking me to "Come to the plant because we can't fit the pipes no matter what we try." So I went. I looked at the pipes - custom-made pipes, ready-made pipes - but they were all according to the spec. But they did not fit. Why didn't they fit? We thought of various possible causes but we couldn't figure out. Then, after a night's sleep I suddenly realized: the companies that supplied the pipes used different standards in determining the specs. Monju was being built by different companies working together, Hitachi, Toshiba, Mitsubishi, Fuji Electric, etc. When they drew up the spec, Hitachi, where I used to work, would round down 0.5 millimeter. Toshiba and Mitsubishi would round up 0.5 millimeter, Nihon Genken would round down 0.5 milli-meter. It was only 0.5 millimeter, but it made a whole lot of difference when there were 100 different parts that needed to fit together. So the pipes didn't fit, even though they were exactly to the spec and fit perfectly on the blueprint. So we have all of them re-made. Since it was a national project, money wasn't an issue; the national prestige was. How did this happen? Each company had its own know-how and secrets, and they didn't bother to discuss which method to use, round up or round down. Since Monju was a national project, reworking of the pipes were done no matter how much the cost was. Fukushima I Nuke Plant wasn't. It was a TEPCO's project. And TEPCO, having been run by succession of presidents with education and expertise in economics and finance, is known for relentless cost-cutting, sometimes at the expense of safety and performance, critics have argued. On the other hand, 0.5 millimeter difference may be all within the tolerance, and it wouldn't have mattered even in Monju if they had forced the fit. All I can tell from Mr. Hirai's paper is that the engineers at the Monju Reactor were worried enough to call Mr. Hirai to the plant. Some exotic names. The Reactor 1's trench was supposed to have been filled with tsunami water. It's just disgusting, but this is one sure way to spot a politician from half a globe away: he/she cannot help but play the proverbial "fiddle" while the world around them literally or figuratively burns. Here are two snippets from Sankei Shinbun, which is considered to be right-leaning and where you're likely to find more critical coverage of the DPJ (Democratic Party of Japan) administration. But in the cases below, both the DPJ and the opposition LDP are acting like they are true-blue pols. First, the DPJ politicians and their secretaries will get their party "uniform" to wear when they appear in front of people in earthquake related matters. The Democratic Party of Japan (DPJ) has decided to order a party "uniform" for the earthquake of March 11 (Higashi-Nihon Dai-Shinsai - Eastern Japan Big Earthquake). The right sleeve of the uniform will have the DPJ's name and logo mark. Color is navy blue, and it will be available in 8 sizes from SS to 5L. It will cost about 5,000 yen (US$60) a piece, and will be distributed in mid April. Next (the link goes to Sankei article in Japanese) a female Upper-House representative of LDP (opposition party now) and her 10 pals in the LDP decided to demonstrate the safety of vegetables and fruits from Fukushima by eating the vegetable and fruit salads. The purpose was to send the message that it was totally safe to consume vegetables and fruits harvested in the area affected by the radioactive fallout and the areas surrounding it. This representative, Tamayo Marukawa, is a 40-year-old former announcer at Asahi TV. Totally used to "performance", as they call in Japanese. That news is there in Bloomberg Japan's site in Japanese, which is basically what CNN reported in their 2nd update. But it is nowhere to be found on Bloomberg US site, yet. Interesting. On March 30, IAEA disclosed in their press conference in Vienna that there is a possiblity that Tokyo Electric Fukushima I Nuclear Power Plant has achieved "re-criticality", and IAEA are proceeding with analysis. Bloomberg Japan's article says at the bottom of the article that it has been translated, supposedly from English. But as I said above, I can't find it at Bloomberg US site. Oh I forgot! Fukushima I Nuclear Power Plant's accidents are so "over-hyped" outside Japan and that the US media should "apologize" for over-hyping! My bad.. So far, as of 5:47AM JST on March 31 in Japan, NOTHING on Kyodo News, Yomiuri, Asahi, Nikkei, Mainichi, Sankei. Only Bloomberg Japan. If indeed the reactor has gone critical again, the whole concrete dome idea may have to be promptly scrapped. Don't see anything at Bloomberg site yet. that TEPCO Chairman Katsumata mentioned in the yesterday's press conference. Skadden is representing the Tokyo Electric Power Company, Inc. (TEPCO), which entered into an agreement with Nuclear Innovation North America LLC, a nuclear development company jointly owned by NRG Energy, Inc. and Toshiba Corporation, to acquire a 10 percent interest in the planned expansion of the South Texas Project nuclear plant. TEPCO's investment, announced May 10, marks the first time a Japanese utility has invested in an overseas nuclear power project. This will be the first project in the United States to utilize Advanced Boiling Water Reactor technology. "Advanced"? After the GE-designed, Toshiba-made boiling water reactor in the Reactor 3 at Fukushima I blew up? I suppose TEPCO and Toshiba have since refined the technology after they installed the Reactor 3 at Fukushima I Nuke Plant in 1974. Advanced boiling water reactor, according to wiki, is currently offered by GE Hitachi Nuclear Energy. Fukushima I Nuke Plant's Reactor No.6 and 7, whose construction was scheduled to start in April 2012, were planned to be ABWR. And the Texans seem to remain bullish on nuclear energy and believe TEPCO will not pull out. Japan's still-unfolding nuclear crisis has shaken investor confidence in prospects for a US nuclear renaissance, but it remains unclear if the March 12 accident at a Japanese nuclear plant in the aftermath of a 9.0 earthquake and subsequent tsunami will slow or even stop US nuclear projects now in advanced stages of development. ... The plan by Nuclear Innovation North America, an 88/12 joint venture of NRG Energy and Tokyo-based Toshiba, to add two 1,350-MW advanced boiling water reactors at the South Texas nuclear project in Matagorda County, Texas, faces perhaps the most immediate uncertainty. Toshiba supplied the GE-designed boiling water reactor at Fukushima Daiichi Unit 3, whose reactor roof exploded on Monday. And both that unit and Fukushima Daiicchi Unit 1, which suffered a similar fate on Saturday, are owned and operated by Tokyo Electric Power Co., which last May committed to buy up to a 499-MW stake in the South Texas nuclear expansion. NRG spokesman David Knox said Monday that it is too soon to comment on whether the Japanese nuclear crisis might lead Tepco to shift its attention to rebuilding its crippled nuclear generation fleet at home and withdraw its plan to invest in US nuclear capacity. "Our focus is on our friends and partners" in Japan, Knox said. "There will be time to assess the impact [of Japan's nuclear crisis] on nuclear development in the US in the days and weeks to come." Tepco said last May that it will pay NINA $125 million for a 10% share of the joint venture, which owns a 92.375% stake in the South Texas expansion project, once the Department of Energy has issued a conditional commitment to the project's developers for a federal loan guarantee. Tepco also agreed to pay NINA $30 million for an option to buy an additional 10% stake in NINA about a year later for another $125 million. Tepco's initial 10% stake in NINA will give it a 9.2375% interest in the expansion project, and its second 10% stake will increase that interest to 18.47%, or 499 MW. CPS Energy, the San Antonio municipal utility, owns the other 7.625% stake in the expansion project. NRG's Knox said that "nothing happens" regarding Tepco's commitment to join the South Texas expansion project until DOE has offered the project a conditional loan guarantee. The proposed loan guarantee is currently being reviewed by the Treasury Department and the White House Office of Management & Budget, he said. It would then go back to the DOE Credit Review Board for approval before being issued. "Considering everything that's going on I wouldn't want to hazard a guess" on when that conditional loan guarantee might be forthcoming, Knox said. Leading proponents of "new nuclear" said that they do not believe the Japanese nuclear crisis will delay or kill US projects now under development. After today's Obama's speech, Mr. Knox can rest assured that the federal loan guarantee will be forthcoming shortly. So the Japanese are not the only delusional people. Good to know.